Keep your pool covered but easily accessible with the Thermo-Tex Swimming Pool Solar Pool Cover, our top pick for solar pool covers. Not only is it affordable, but it's praised by customers for its ability to be folded up and set aside during swim time. This solar pool cover earns plenty of praise for raising pool temperatures and reducing evaporation, but what really sets it apart is the number of people that say it’s easy to fold up and take off. The 6-mil plastic is thinner than some other solar pool covers on the market, which likely accounts for the ability to handle this pool cover easily. Don’t let the thin nature of the solar cover deter you from buying it—as one person points out, it’s better to buy a pool cover you’ll actually use than a heavy, bulky version that will end up sidelined all summer. The longevity of this solar pool cover really depends on environmental conditions. Some people have had the same Thermo-Tex solar pool cover for multiple seasons, while others replace it with a new one every year. Available in two different shapes (round and rectangular). Interested in reading more reviews? Take a look at our selection of the best pool cleaners. If you're in the market for a solar pool cover but you don't want to spend a ton of money, we recommend the Intex Round Solar Cover. This small pool cover measures 11.5 feet in diameter and may only last a season, but for the budget price, most reviewers don't mind. Some customers have even found some surprising ways to use it. This budget solar pool cover includes draining holes to keep water from accumulating on top of the cover and claims to reduce evaporation by 95-percent. Despite being the best fit for 12-foot round pools, many people use several of these round covers in bigger pools so that they don’t have to wrestle with one large pool cover. A few of these lightweight pool covers make it much easier for a person to cover and uncover the pool alone. One of the biggest complaints about this pool cover is the fact that it has been known to break down and leave plastic pieces in the pool. Some people in areas with a lot of direct sun (like Arizona) found it started disintegrating only halfway through a season. However, plenty of other people are happy with the heat retention this budget pool cover provides and have no problem picking up another one for less than $25 when the time comes. Give your above ground pool a helping hand in retaining heat and preventing evaporation with a round solar pool cover. 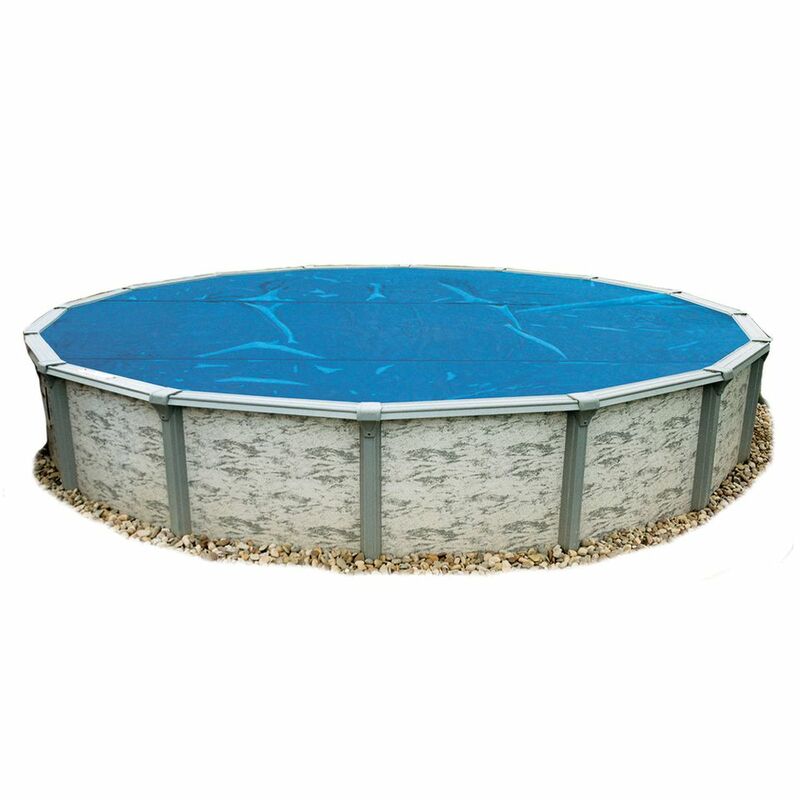 The Blue Wave 8-mil Solar Blanket is a highly-rated option for round pools between 12 and 33 feet in diameter. Made from a UV-resistant polymer, this solar pool cover will stand up to sun exposure and pool chemicals while raising the temperature by up to 15 degrees. Users agree that the difference in pool temperature is noticeable when using this pool cover. The many small thermal bubbles covering the surface of the cover absorb and retain heat, resulting in warmer water and more swim time. The 8-mil thick polymer isn’t the thickest option on the market but seems to perform well and offer a good value. People frequently report that this pool cover lasts several seasons of use before needing replacement. Interested in buying a new pool? Check out our list of the best above ground pools that you can buy now. Don’t go round and round looking for the perfect solar pool cover for your rectangular pool. Check out the perfectly proportioned and well-made Sun2Solar Rectangle 1200 Series Solar Cover. The 12-mil plastic construction of this solar pool cover makes it an excellent choice for retaining heat and preventing evaporation, while the surface of the cover absorbs UV energy. Available in sizes ranging from 4’ x 8’ to 30’ x 50’, there’s plenty of options to choose from. But in case it’s not a perfect fit, all sizes include an extra two to four inches of material so that you can cut to fit (which won’t affect the warranty on seams or delamination). People that have this rectangular pool cover find it to be well made and excellent at holding heat and preventing evaporation. But what really sets it apart is that its dimensions are true to size. As one reviewer points out, it’s much easier to correctly roll up a rectangular pool cover that has sides of proper lengths and matching dimensions. Instead of struggling to roll or fold an irregularly shaped rectangular pool cover, give the Sun2Solar 1200 series a try. If you have an oval-shaped swimming pool, you need a specially shaped solar cover to keep your pool water warm and clean from debris. Round or rectangle solar pool covers may leave the edges or ends of your pool exposed. The Midwest Canvas 16-mil Oval Solar Pool Cover is a just-right fit for oval-shaped pools ranging up 21’ x 41’ in size. This solar pool cover is heavy duty, with a 16-mil polymer thickness. It also is unique in that it features diamond heat retention pockets instead of the standard round bubbles. According to the manufacturer, the diamond pattern fits more solar heat pockets into the same surface area—increasing heat retention for your pool. The cover can also be trimmed to fit your pool’s specifications, including space for features like stairs. Keep in mind that the 16-mil thickness provides extra insulation but is a little harder to fold up according to users. You might need an extra set of hands to help place or remove this oval pool cover. Opinions are mixed on the clear plastic used for this solar blanket. Some people like the brighter look compared to blue covers, while others found the ‘clear’ color to be almost white in appearance. Solar pool discs claim to offer an easier way to reduce evaporation and increase the temperature of pool water. This set of 6 by Solar Sun Rings is a bit pricey, but it might be an easier option for (mostly) covering your small pool. Each solar pool disc features an inflated ring that keeps it floating on the water’s surface, where the UV-resistant center absorbs the sun’s energy and heats the water underneath. The floating solar rings also serve to reduce evaporation, though they don’t cover as much surface area as a conventional pool cover. Still, these make an attractive option as a solar cover for a small pool. People find these solar rings easier to put in and take it for one person than a full-size solar cover. They’re a better choice for small pools since it would require too many to cover a larger pool and you’d lose the benefit of quick and easy set-up if you had to place and retrieve many solar discs every time you wanted to use the pool. The main reason these solar pool rings don’t earn better ratings is that sometimes the outer ring deflates; however, the manufacturer has a track record of replacing defective units. One person also points out that if your pool’s water level is low, the disc could be sucked into the skimmer. Add an anchor or tie two discs together to prevent this problem. Looking for a smaller sized pool for your little ones? Take a look at our selection of the best kiddie pools. If you want a heavy-duty solar pool cover that’s worth the splurge, consider the Sun2Solar 1600 series. These pool covers are available for both round and rectangular pools and come in clear or blue color options. The 1600 series solar covers are made from 16-mil polymer to offer increased heat retention and durability. According to users, this also means that they’re considerably heavier than pool covers made from lighter gauge polymer. However, people find that the extra effort is worth it for the savings in heat and water. The option for a clear solar cover is also a plus since it allows UV rays from the sun to reach deeper depths of the water. This might be a plus for larger pools that tend to stay cooler the deeper you go. You’ll spend more on this splurge solar pool cover, but the thick durable material and well-made waterproof seams make it a worthwhile buy for any size of pool. Save some hassle by opting for a solar pool cover with a reel. By connecting your pool cover to a reel, you’ll be able to quickly and easily cover or uncover the pool’s surface with a simple crank operation. Intex makes a rectangular solar cover and reel bundle that will have you opening and closing your pool in no time every time you want to take a dip. The Intex Rectangular Solar Cover with Reel is designed to be used with the brand’s popular 17’ 8” x 8’ 4” rectangular frame pool, but many people have used it with success on other 18’ x 9’ pools. You could use the reel with a rectangular cover in the dimensions required for your pool, if necessary.